Can a small niche destination become a regional anchor destination? That’s an apt description of the Corning Museum of Glass. Promoting any destination takes creativity and hard work. Our guest in this episode brings both to her work, and examples of both for us to learn from. 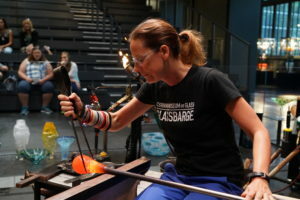 In this episode, we talk with Beth Duane of the Corning Museum of Glass. Throughout our conversation, she explores how the museum has shattered stereotypes about what a glass museum can be. For instance, kids are very welcome – they can attend for free in fact. And she explains how promotion of the museum happens in so many creative ways. Beth joined the Corning Museum of Glass in 2001 as the Marketing Manager, became the Director of Marketing and Community Relations in 2008, and Chief Marketing and Communications Officer in 2017. In this position, she is responsible for developing, implementing, and managing all marketing and sales initiatives for the museum. This includes overseeing the activities of the tours and sales staff, directing guest services, events and programs, membership activities, and developing short and long-term marketing, sales, and membership goals. She is a member of the museum’s leadership team. Beth served as project manager for the March 2015 opening of the new contemporary art and design wing. She championed and authored a third round consolidated funding application, which resulted in $1.5 million grant for the museum’s International Motor Coach entrance, plus sixth and seventh round Market New York Grant applications, earning awards totaling over $300,000. Beth received her bachelor’s degree in marketing and management from Alfred University in New York. She has previously held positions at the Statler Hotel and J. Willard Marriott Executive Education Center, the Sheraton Inn, and Conference Center, and Schuyler Arc, and is actively involved with several professional and community organizations. Thank you for joining me, Beth. Nicole, thank you. I am very happy to be here today. I’m looking forward to our conversation. But before we get started, you have an impressive background and bio, but I know it only tells a part of the story of who you are. So I’d really like to have you tell our listeners in your own words, a little bit more about you and your journey. Sure. It’s interesting because I have two sons, ages 21 and 23 now, and it’s taken me back to that time in my life. Hard to remember that far back, but back when I was in college. I realized I went to college because that’s what was expected of me, but I didn’t know what I wanted to do. I took a safe route, I guess, with marketing and management. Just believing that you can use those skills, no matter what you choose to do in life. I grew up in the Finger Lakes region of New York, and upon graduation, I lived in Watkins Glen and took a job with the Schuyler Arc as their workshop coordinator. And as you can appreciate, when you work for a nonprofit, even though your title may be one thing, you do such a variety of things. That first job was so rewarding in many, many ways, and it was very telling for me as well. I learned a great deal about a variety of things. And I think what was most important is I learned what I didn’t want to do in my career. But I started developing a pretty strong network right out of the gate, and that’s when an opportunity became available for me to work at a hotel in a sales manager position. Before then, I thought you just checked into a hotel, laid your head on your pillow at night, got a good night’s rest and checked out. I didn’t know all the inner workings of running a hotel operation. I fell in love with the hospitality industry. I realized that was my calling. I loved taking care of people, the challenge, and then the interaction with not only your guests but the close network in the hospitality industry. And that just led me through my career with Sheraton, and then ultimately with the Statler. The Statler at Cornell is where I realized the most powerful thing for me was combining hospitality with education. There was just something about interacting with the students, although sometimes it was very challenging, I will admit. You know, trying to run an operation with students that maybe were out way too late on a Friday night, and you needed them to work room service, Saturday morning. Ha! At any rate, I just fell in love with the combination of hospitality and education. I probably would still be in the hotel industry if this opportunity with the museum didn’t come along, it was a point in my life where my kids were young. And with hotels, it’s 24/7, and I was realizing when my husband needed to bring the boys to have dinner with me at the hotel for me to see them, there was just something out of kilter. So again, through a network, I was asked to interview for a position at the museum. And I was so dedicated to the hotel, at first I wasn’t interested. And low and behold, I took the job, and I’m still here, 17 years later. So I think I found my passion, through and through, and that is delighting people. It’s interesting how you started this story talking about where your sons are in their lives right now at ages 21 and 23, and how reflective that can be as you watch your children go through it. So you remember what you went through. One of the things that seem to be a theme with a number of my guests is how they are pulled into this industry, not necessarily going to college and thinking I’m going to work in travel and tourism, or I’m going to work in hospitality, but how you kind of get pulled to it, and how that happened for you as well. I think that’s just awesome. Yeah. You do need to be wired the right way for this industry. It’s a very rewarding industry. It’s a very intense industry though, as you know. It requires you to be on at all hours, day and night, days of the week. And even if you’re having a bad day, you can’t let that reflect on your guest’s experience by any means. One of my sons, he knew what he wanted to do and only applied to one college. He was going to get in, and he did, and he graduated and has a job in his field of study, which is phenomenal. And then, my youngest son, he’s such a great, intelligent kid, just doesn’t know yet what he wants to do. I see the frustration. I see the second-guessing, like why don’t I know it when all my friends know it? But he’s not alone; there are many people that don’t know. They’re young, for goodness sake, and even people that maybe have been in an industry for a while, they realize that they want something different mid-career, so there is no set course. The one thing I will say is if you don’t enjoy people, you should get out of the hospitality industry. It’s not the appropriate place for you. I think that’s great advice. I like how you talked about how this industry is rewarding, but also intense, right? You need to be drawn with it and be wired for it, so I think that’s just wonderful advice. So, Beth, I want to jump into these questions. As you know, on our show, we look to focus on creativity and collaboration. We’re going to start with creativity, and don’t worry if we end up talking about collaboration alongside creativity. It always happens. I find it’s hard to talk about one without talking about the other. The tourism and hospitality industry is very competitive. There are so many choices out there as to places where people can visit. There is also competition for people’s time. There are so many different things people can do with their free time. I’m wondering what you have done to help Corning Museum of Glass stand out from the crowd? Well, I agree that it is very competitive. I can go quickly to the time of year we’re in right now. It’s summertime, and we are located in the beautiful Finger Lakes region. There are so many activities to do outdoors and today is a gorgeous day. I can imagine that people are enjoying the hillsides and vineyards, and hiking, out on the water, and all those outdoor activities. We at the Corning Museum of Glass don’t want to force people to choose between the outdoors and the museum. So one thing that sounds simple but we implemented many years ago is remaining open until 8:00 PM all summer long, so from Memorial Day to Labor Day, people can spend the day outdoors and have that outdoor fun, and then finish their day and the evening with us. It seems to be a formula that works well. We have an average touring time of four hours at the Corning Museum of Glass. And if we didn’t stay open until 8:00, even the people that arrive here at 3:00 or 4:00, they wouldn’t come because we’d only be open one more hour. We close at 5:00 PM beyond the summer hours. When I first started here, my boys were four and seven, and I thought, “You want me to bring my boys to this museum? You’ve got to be nuts.” But yet, this museum, even though it’s glass everywhere is very kid-friendly and very family-friendly. My boss at the time, Rob Cassetti, and I were on a road trip between Seattle and Tacoma. We came up with the idea of kid’s free admission. That was back in 2003, and we were only going to do this for a summer. It was so successful that we extended it to the end of 2003, and it never stopped. It’s been kids free, 17 and under, ever since. So you never know where inspiration is going to hit you, and you just have to go with it. I love both of those examples because, in both examples, you’re talking about understanding your guest and your visitor, coming to where they are instead of making them work within the confines of what you have set as the museum. Meaning we close at 5:00, so you need to come before 5:00, or this whole idea of having kids come free and trying to appeal to the family audience. And I remember when you launched that because I had two young children at the time, and since then, I’ve had two more, so I have four all together. But I remember at the time thinking to myself, “Oh my gosh. I’m never going to bring my kids to a glass museum.” I thought I’d owe you all kinds of money by the time we get to leave. I think once you offered kids free, it made me rethink that. Right. And then we realized we need to have family activities. So we kind of did it backward, but at least we got the promotion going, and we threw some programming for the summer together to support the kids free and the family activities. This is where one of the programs I’m fondest of, called You Design It; We Make It! was born. Kids of all ages, I’ll say, can draw something they would like to see made out of glass. And then, the gaffer that day selects whatever inspires them. It doesn’t have to be the “Best” drawing. It’s just whatever inspires them that day. And then, it’s made at a demonstration, and then the next day, the person who drew it gets to take that glass home with them. That’s cool. How fun is that? This is really where you started with this whole conversation, when you talked about your background and what drew you here; how you like to delight the visitor and delight your guests. You Design It; We Make It! Talk about delighting your guests, right? I feel very, very fortunate with the areas that I am most directly engaged with at the museum because I have always been involved in marketing and certainly in my hospitality or my hotel days specifically, you engaged quite regularly with the guests. I mean who in the industry hasn’t had to turn rooms quickly, and scrub a few toilet bowls, or park a few cars, or whatever. And what’s great here at the museum is I also manage the guest services, so I have the direct connection from the guest to marketing, and vice versa, and that keeps me inspired and motivated. Well, I want to switch gears just a little bit. I am still staying on this topic of creativity, but what I would like to do is explore with our guests, creativity that happens when we’re faced with adversity or a challenge. And I’m wondering if you can share with us a challenge that your organization has faced, and then the creative solution that came from that challenge? Boy, there are so many directions I could take this. And so, I probably will end up sharing a few different thoughts as we got through this. We’re located in fairly rural New York State. When we see a visitation of over 450,000 people annually. That doesn’t happen just because we have the open sign on. There’s a whole team of professionals that are focused on this, day in and day out. From our sales team that’s on the road throughout the northeast and internationally, to our hot glass outreach team. This is pretty unique. We have a glass barge traveling New York State waterways. We’re a mobile invitation to come and visit the Corning Museum of Glass. I can’t afford to advertise in Brooklyn, but we had this glass barge in the New York Harbor in Brooklyn for close to two weeks. We were able to get some pretty phenomenal publicity as well as engage intimately with many Brooklyn residents as they boarded the barge and got a little flavor of the Corning Museum of Glass. We’re venturing up the Hudson right now, and I just spent a fabulous weekend in Poughkeepsie. Boy, that community is so in love with their city and in love with the arts. We felt so welcomed. Mary Kay Vrba and her whole team did such a great job welcoming us there. We try to think of different ways to look at what we do, and how to make sure people remember us. We have the name “Museum” in our name, obviously, and it will remain in our name, yet we’re a museum and experience, all-in-one. We have some very attraction-like features, if you will, with over 50 glass demonstrations every single day in the summertime, and fun demonstrations called “Don’t Try This At Home” or a glass-breaking demonstration. The things that would set us apart and maybe get the family intrigued. Sometimes people just aren’t museum-goers, but we try to make sure they understand it’s the museum experience plus make your own glass. So you can get really hands-on with glass. What is cool about this is how proactive you are in helping to attract people – even though you are in a rural location and competing with the great outdoors. That’s an interesting perspective; we can’t afford to advertise in New York City or Brooklyn, the Bronx, in that area. But yet, you bring this glass barge there, and you’re getting all of this attention. I’m sure; you’re getting a lot of earned media coverage, but also that whole word-of-mouth. I can just imagine the social shares that are happening with that. Yes. And the great thing, when we’re on the road or water, we’ve blown glass on three Celebrity cruise ships for ten years around the globe. We know that we can’t just talk about the Corning Museum of Glass. These people are traveling from all over the globe. We’re promoting the Finger Lakes constantly. We’re promoting New York State. Sometimes you have to start with the northeast and travel through the funnel if you will. We’re promoting the entire destination and not just the Corning Museum of Glass. I wrote a note to myself that Corning Museum of Glass is actually an anchor for the Finger Lakes region in that when you mentioned you get 450,000 plus visitors a year. That’s significant, especially for the area where you are to pull those people in. So this whole idea of promoting the Finger Lakes or New York State, or even the northeast, depending on where you are so that people can get a sense of place; how interconnected all of that is. But also, the role that you play in helping this area of New York State thrive with visitors. Yes. And can I just brag one moment, and say that Corning, New York is a city of just shy of 11,000 people, and we were just named by Smithsonian Magazine as the number one of small towns to visit this year in the USA. So yes, we’re really proud of that. It’s a great little city. Very charming. We like to say small town, worldwide impact. Becoming a top place small town to visit in the USA in Smithsonian Magazine doesn’t happen by accident, right? It’s not just dumb luck that you ended up there. You’ve got a lot of the right things happening. It’s all of these things that you’re talking about, and I’m sure so much more that even put you on the radar to be considered for a list like that, let alone to land on the list, right? You’re absolutely right. And perhaps, that may be a reason why TBEX, the Travel Blog Exchange of North America is going to be in our neck of the woods in September of this year. So we’ve got all of these travel content creators and influencers traveling to the Finger Lakes wine country, and the meeting venue is the Corning Museum of Glass. So we’re excited to showcase our museum and our region to hopefully 600 bloggers in the middle of September. That’s really exciting, and what a cool meeting space too. That will be a very memorable conference for them. Not only in the Finger Lakes, but in the Corning Museum of Glass. That’s awesome. You have no idea how timely that comment was because we just had four bloggers here on a TBEX visit yesterday, and they said those very words, Nicole, that this is the most unique venue that they’ve ever been in. I’m sure that’ll pay dividends. I mean the more memorable you can make it, the more they’ll go back to it. And hopefully, talk about you and write about you, and elevate, not just obviously the museum, but the whole region. What are you looking forward to in the future? Are there any projects that you’re excited about in the coming months? We have a few different projects in the works. Our focus right now is preparing for feedback, and we have three more months on New York’s waterways with the glass barge. I think we have 27 more communities that we’re going to be stopping in, and we get to Waterford, June 23 and 24, and that’s when I say we turn left on the Erie Canal. And so, really looking forward to celebrating the bicentennial of the Erie Canal for all of July and August. And then, we start to venture our way down through Seneca Falls and to Watkins Glen in September. The itinerary was put in place before we knew about TBEX. But as the stars were perfectly aligned for us, the glass barge will be arriving in Watkins Glen when TBEX arrives in town. So it’s kinda cool that we’ll be able to show that off too. That’s great. And you have a big final event in Watkins Glen. Yes. The community of Watkins Glen is excited, and I know NYPA, the New York Power Authority, has looked to Watkins Glen as the place that they want to heavily engage in. There’s a lot of time and energy being put into that final weekend of glass barge, which is September 14 through 16. That’s great. Well, I knew that there would be no shortage of things to talk about, especially on the topic of creativity, but I do want to switch gears and talk about collaboration because I also know you have a lot to say about collaboration as well. You’ve already demonstrated that talking about the glass barge project and the work that you’re doing with the New York Power Authority and the Erie Canal, and all of those communities on your itinerary along the way. But I like to explore this whole idea of what I like to call coop-etition. It’s something I think that is unique in our industry, where perceived competitors come together and create things that are bigger than things that they can do on their own, and essentially collaborate. And so, I wonder if you have an example of a collaboration that has worked for you? Well, I love your term “coop-etition” because I suspect it’s that case across many industries. But in the hospitality industry especially, you can’t go it alone. I mean you can, but I don’t know how successful one would be if that’s the path that you choose. And so yes, you’ve got to be very purposeful with how you partner with what at first glance may look like competition. But if you do it right, then it can be beneficial for both. I immediately think of from local examples and then much more broadly. So I’ll begin with the Rockwell Museum, our sister museum here in Corning. Again, it’s a small town, but we have two phenomenal museums. And especially on the local level, we’re competing for the same visitor regularly. But instead of competing head-to-head, we have a “visit two museums and save” program. And so, it’s a combination ticket that anyone who purchases the combination ticket saves money on the admission of each individual museum. Regionally we are involved with a program for about ten years with the Wine Water Wonders of Upstate New York. I know you’re familiar with the program. Wine Water Wonders partners the Finger Lakes Tourism Alliance with Rochester and Niagara Falls. We have these itineraries that we market internationally to get that international visitor, whether as part of a group or individual to spend more time in upstate New York and think beyond New York City when they think of New York. Because we’re an attraction and not one that’s specifically directly funded by tax dollars, we also can think beyond the state borders. And while Hershey in the Harrisburg, Pennsylvania area is competition for Corning and the museum, we work with them on some packaging and itinerary-building, knowing especially when we’re talking to the international market, coming up from Washington, D.C. and heading to Niagara Falls. It makes sense to stop at Hershey, and then at the Corning Museum of Glass, and then go on. From all three of those examples, demonstrate that visitors don’t come to a region for just one thing. And they don’t think really regarding state borders. I think we’ve come full circle to talk about coming to where your visitor is, meeting what their wants and needs are, instead of trying to force them to fit into something that doesn’t make sense to them. We see some great successes with that. You get out of it what you put in, and it’s been a long labor of love, no doubt, especially for the few people that are most directly managing and engaged in the program. But it’s paying off, for sure. I conduct some research, and we do daily customer surveys here, and then I have, of course, zip code tracking and a few other kinds of research that we do here. I rely on that research heavily to identify partnership potential, even if it’s not obvious to me. Data is your best friend. I trust my gut a lot, but you can’t ignore data. Data definitely can be a powerful roadmap. Where do you look for and how have you found great partnerships? How do you use data to identify potential partners? Can you talk a little bit more about that? I was just at the Museum Association of New York’s annual conference. So many museums, I think, struggle with, first of all, knowing what to collect. And then secondly, once they collect it, understanding how that can help them. Could you share a little bit more about how you use that data, and how that’s helped you find potential partners? I’m happy to. I’ll start with just zip code capturing because even if it has to be a manual process, understanding where your visitors are coming from will inform how you engage and where you communicate, and/or advertise or go after earned media most heavily. Instead of guessing, you can use zip codes to target where you’re feeding and promoting your message and your activity. And then, you can use those same zip codes to track the success, or maybe not, of those initiatives. I strongly encourage anybody that has the opportunity to engage with a guest to the point where they can ask for a zip code. Most people are more than willing to give a zip code. It doesn’t feel invasive at all. I am fortunate that we have a daily customer survey that we’ve had in place since 2000. I guess right before I came to the museum, so a very long time. It’s a pretty lengthy survey, believe it or not, but people will answer all the questions. They are told upfront that they’re going to get a thank you gift. It’s a beautiful glass sun catcher, but they don’t know it when they fill out the survey. They get it after they’ve completed the survey. So we have a very high completion rate. It varies between 60 and 70%, so it’s good data. But one thing specifically I’ll talk about is partnerships and how we figure that out. We ask people where they stayed last night, and where they plan to stay tonight. And sometimes it’s in their own home, but other times they’re filling out not only the location but the specific B&B or hotel, or campground. We then use that for billboard placement, understanding how our guests travel. And then more specifically, we use it to reach out to hotels and B&Bs, and campgrounds to build packages. The Watkins Glen KOA has our day passes built into a package. The local Radisson has museum passes built into a package, and we’re able to track how that is going. So that’s a very straightforward example of how we build partnerships. A very unique partnership, I think, is that the museum and a racetrack are partnering. And one would scratch their head – what does a museum have in common with a race track, and vice versa? But the two entities, have been in the conversation for a long time, understanding the important roles that we each played in economic development in the region, and the success of the region. Ultimately, what we’ve done is the Corning Museum of Glass creates the winner’s trophy for the NASCAR race that happens each August. We provided Watkins Glen International (WGI) with a unique trophy that takes in the region; from the iconic blue guardrail of WGI to looking a waterfall from the side, taking in the beautiful scenery, and it’s placed on a Finger Lakes bluestone base. Again, taking in the region. So of course, it’s all glass. But then, we’re able to promote to an audience that we have been working so hard to convert to visitation, and it’s working. It’s a unique partnership, but a strong partnership and we’re very proud of it. That’s great. You’re so creative about your product placements. The glass barge that is out, your roadshows that you take out for your live glassmaking shows. Here’s another way, you’ve got this beautiful trophy. I mean NASCAR, how many eyeballs are on a NASCAR race? I know it’s on TV in my house every weekend, so it’s another way to showcase and bring attention and awareness to the Corning Museum of Glass. And then, of course, the region and the Finger Lakes. I think those are great examples. And thank you for talking about the zip code capturing and the daily customer survey because of both of those things, especially the zip code capturing, sound relatively easy enough for data collection. And then, can be very helpful tools regarding knowing and understanding where your customers are coming from to help inform you with your marketing messages. Thank you for sharing those. You’re welcome. And just one last thing I want to say about partnerships is it’s important to not enter into a partnership because you think that’s what should happen. You’ve got to make sure it is mutually beneficial. You have to make sure that it’s truly a two-way partnership because otherwise, the things could fall apart quickly if one entity is not as invested as the other. Then, there can be failings, and you could have the exact opposite effect or impact that you were hoping for. So wherever you can outline what those expectations and/or outcomes are, I encourage you to do so. That’s great advice. Thank you for adding that. So Beth, I knew this would be a great conversation. I knew our time would go quickly because we have so much to talk about, and you have so much to share. But before we wrap up and say goodbye, are there any final thoughts or anything that you’d like to share with our listeners that I haven’t asked you yet? Well, of course, I’d be remiss if I didn’t invite each listener to the Corning Museum of Glass. Even if you’ve been before, I guarantee you it’s a new experience each time, and we are always changing things and adding things. I encourage you to discover your own backyard, and come and enjoy some of your time at the Corning Museum of Glass. So that’s awesome, and again, I appreciate you taking some time out of your busy schedule to be with us today, Beth, and we’ll look forward to catching up with you again soon. It’s been my pleasure, Nicole. Thank you.